(BEAVER FALLS, Pa.) – Program directors for Geneva College Graduate Programs invite prospective students from the Geneva community to an All Graduate Programs Open House in the Benedum Room, Alexander Hall on Monday, April 8, from 4 to 7 p.m.
Community members interested in earning a Geneva master’s degree in Counseling, Cybersecurity, Higher Education or Business Administration (MBA) are invited to talk to program directors, faculty, and enrollment managers from all on-campus graduate programs and enjoy a light buffet. Prospective students can drop in any time during the open house. 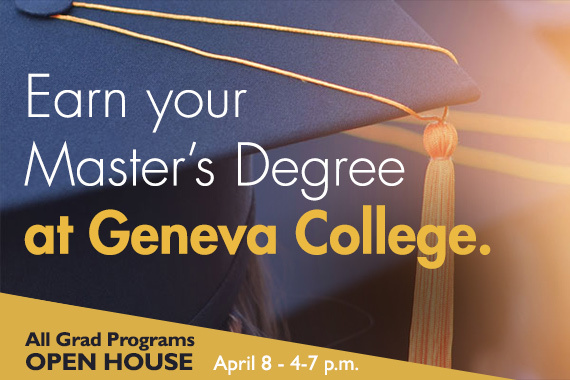 Registration by April 5 can be made at Geneva.edu/GradOpenHouse or by calling 724-847-6697. Geneva’s traditional graduate programs offer the following degrees with classes based in Beaver Falls. Geneva may also offer some classes online or in Cranberry Township.